The Jewish district in the Marais (around Rue des Rosiers) is usually considered the best place to eat a falafel in Paris. But it’s also very touristic, quite pretentious and expensive. Thus, I prefer having a falafel at Maoz Vegetarian, Left Bank. 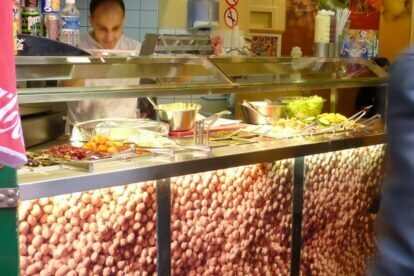 While in Rue des Rosiers, sandwiches are usually made like in an assembly line formation and standardized; at Maoz, you have the choice and time: indeed, the waiter only gives you a pita filled with 5 falafel balls (fried aubergines or hummus can be added for 1 € more), then you’re free to fill it up at the salad bar (picture), with carrots, beetroot, olives etc. and different sauces. And if you eat your sandwich at the restaurant, you can refill it with vegetables as many times as you want and take your time to eat it. There’s a great science involved in pita-filling!!! If you want your sandwich to be homogeneous & not too dry, remove one or two falafel balls from the bottom before adding the vegetables and sauces. And if you can hold off one minute before biting into your sandwich, I suggest you enjoy it in Square Viviani, which not only offers benches and a lawn with a great view on Notre-Dame, but also has a free water fountain (spring/summer), which can be a great help if you’ve added too much sauce from the second row of the salad bar (spicy ones). There’s another Maoz at 36 rue Saint-André-des-Arts (5 minutes towards Odéon), which also sells Moroccan soup & vegetarian couscous.